Almost all segments listed below are areas shown as "double yellow lines" on Bay Trail maps. These sections are unimproved roadways that may be challenging to pedestrians. I would not advise walking with children or dogs on these roads; there is not usually room to walk two-abreast on these roads. Specific observations about potential challenges and closures are listed below. 1.) Approach to Dumbarton Bridge - you will be walking on a section of road close to (within 2 yards or less in at least one spot) cars and large trucks traveling 65 miles per hour. 2.a.) Ravenswood Open Space: Northern trail on Menlo Park side of Dumbarton Bridge, closed in 2010 for restoration work. Update: this trail re-opened in Sept. 2010; however, due to adjacent construction going on by CalTrans contractors on the Bridge, there was nowhere to park and walk this trail for several months. So, you may not get to enjoy this new trail until 2012 or 2013, unless public parking spaces are cleared. 2.b.) Ravenswood Open Space: Southern trail was temporarily closed when I passed by on my second trip around the Bay, on Dec. 26, '11. New trail and improvements were being constructed. It appears that this trail will not re-open until construction is done at Cooley Landing (estimated date: Summer 2012). For more information, www.openspace.org, or http://www.cooleylanding.org. 4.) Some construction on waterfront in South San Francisco (Oyster Point) - completed with opening of new ferry location on June 4, 2012. 1.) There are a few fairly industrial areas you may be walking through in Hunter's Point and South San Francisco. Bicyclists should watch for broken glass, nails, rusty screws, etc. 2.) While there are many interesting and worthwhile sights in Southeast San Francisco, there are one or two sketchy blocks to be aware of -- e.g. around Hunter's Point (in between Candlestick Point and Potrero Hill areas). I chatted with a jogger who carried a piece of rebar with her when she went out running for security reasons. I did not have any problems. 3.) Hill (paved asphalt road/path) from Aquatic Park up to Fort Mason (even though it's part of a solid red line trail) might be too steep for wheelchairs and some other wheeled vehicles. 2.) Approach to San Rafael to Richmond bridge (near San Quentin); you will be walking near (within two yards or less) cars and trucks traveling 65 miles per hour. 1.) General Advisory about Highway 37 - Cars and trucks are traveling 65 miles per hour (or faster); on the bridge crossing Petaluma River you will be walking less than 12 inches from fast-moving cars and trucks. 2.) Tubbs Island - the loop trail is breached in two spots, preventing hikers/bikers from making the complete loop (2011-2014). 5.) Highway 116 East, Petaluma to Sonoma section -- Construction going on Summer 2010 - there was no safe area to walk on the stretch of Highway 116 East -- between Adobe Road and Watmaugh Road. 7.) Old Sonoma Road, Napa - A few sections had less than 6 inches of paved roadside walking area, or plants/weeds growing onto roadside. 1.) Vallejo - Highway 29/Sonoma Boulevard - I ran into kids throwing rocks, and there has been a growing crime problem in Vallejo; walk with caution, preferably with someone else with you. 2.) 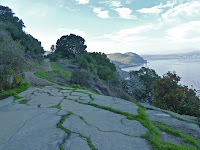 Vallejo - California Maritime Academy - This stretch of trail offers a nice walk along Morrow Cove; and it can be combined with a walk across the Alfred Zampa Memorial (Carquinez) bridge. However, you might want to stay away from the Golden Bear ship that is docked there -- unless you have received specific permission to meet someone there. The ship is not open to the public. 1.) Martinez Regional Shoreline Park - The Pickleweed Trail is closed (and marked with a sign and fence) at the West end, due to trail stability issues near the water's edge. 2.) Alhambra Ave. in Martinez - Pedestrians use extra caution when walking across the Highway 4 onramps (just south of the John Muir Historic Site). Vehicle traffic is moving quickly and it may be difficult for drivers to see pedestrians clearly until they are fairly close to you; and some drivers may be surprised to see you walking there (not a great situation at dusk or when it's rainy or foggy). 3.) Parts of Carquinez Scenic Drive (closed to cars) in Martinez have large sections of road that have collapsed; so bicyclists or anyone on wheels moving at a rapid clip should keep their eyes open for these spots. Update: 2014 - This road has been closed for repairs and is due to re-open by 2015. 4.) Narrower stretches of McEwen Road (2-lane, winding rural road) in the Martinez hills are not advisable for pedestrians; make sure you are wearing reflectors or lights if you're riding a bike. 5.) Wet weather has temporarily closed some trails at Point Pinole to bicyclists and equestrians (March 2011). Puddles/standing water can be skirted fairly easily by walkers. 1.) Oakland - Despite what looks to be a solid (purple connector trail) line connecting the Bay Trail to Lake Merritt in downtown Oakland (on Bay Trail Map), I don't think there's an easy way to walk directly to Lake Merritt along a stream or outlet channel. But, walking along city streets (try Oak Street to the North), to take a detour spin around loop trail encircling this urban Lake is worth a visit. 1.) Fremont/Newark border - Use caution when walking across intersections on Ardenwood Blvd. that are also Highway 84 freeway off-ramps and on-ramps. 2.) Fremont - The section of the Alameda Creek Trail (south side) from Union City Blvd. to Bayview Trail in Coyote Hills Regional Park was closed (for repairs being made to levee/trail) -- delayed re-opening date, moved from end of October 2011 to sometime in December 2011). Update: this segment of trail re-opened Dec. 7, 2011. 3.) The Warm Springs Trail shown on the 2009 hard copy Bay Trail Map I had (shown as double yellow lines -- not fully developed trail) that is accessible from Cushing Parkway/Newark area is closed halfway out to the Bay. Presumably it is closed for wildlife habitat restoration. But, I am not sure.